Patients, carers, scientists, clinicians and charities from across the UK will gather today for the launch of an historic new partnership between the charity Brain Tumour Research and Plymouth University. Together they have established a new Research Centre of Excellence, bringing a sharp focus on some of the most overlooked forms of brain tumours. Around 4,300 people are diagnosed with a low-grade brain tumour in the UK each year. Generally referred to as benign these types of brain tumour, which include meningioma, ependymoma and acoustic neuroma, are graded 1 or 2 on a scale of 4. The lower grade tumours are non-cancerous whereas grades 3 and 4 are cancerous, faster growing and often more immediately life-threatening. Slower-growing tumours are not immediately cancerous, but they can be just as devastating and bring equally dangerous and debilitating effects to patients and their families. They can cause neurological conditions including loss of balance, weakness, memory loss, poor hearing, epilepsy and personality changes. For many, having a low-grade tumour is like living with a time bomb, wondering when it might suddenly grow more rapidly, become cancerous and spread to other parts of the brain or when the tumour may return after treatment. Sometimes low-grade tumours are located within an inoperable area of the brain. The new Centre of Excellence will sit within Plymouth University Schools of Dentistry and Medicine and will be led by Professor Oliver Hanemann. Already holding a reputation as a leading facility in Europe looking at low-grade brain tumours, the team will be able to further advance to translational research – taking research from the laboratory bench to drug testing and clinical trials. This will include exploring potential for the repurposing of existing drugs to ‘fast-track’ potential treatments, instead of waiting for new drugs to be developed, tested and trialled and passed for patient use – a process that can take a decade or longer. By understanding the mechanism that makes brain cells become cancerous in low-grade tumours Professor Hanemann and his research team will explore ways in which to halt or reverse this process. The results from this research will inform investigations into high-grade tumours as high and low grade tumours share some common features. The team will work in collaboration with scientists based at Brain Tumour Research’s network of Centres of Excellence across the UK. 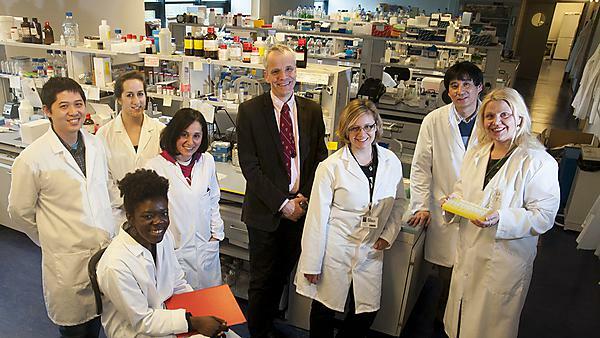 With secure long-term funding from Brain Tumour Research, Professor Hanemann’s team will be freed from the limitations and frustrations of applying for one specific project grant after another, able instead to pursue the sustainable and continuous research so desperately needed. Generous civic support is already being given across the city, including from Plymouth University partners Plymouth Albion RFC, Plymouth Raiders, Devon Junior and Minor Football League and Santander. Brain Tumour Research currently helps fund – through corporate and public fundraising – an annual £1 million programme of research at their Centre of Excellence at the University of Portsmouth. This relationship with Plymouth University, along with additional new partnerships at Queen Mary University, London and Imperial College in London, will pave the way for a £20 million investment in brain tumour research over the next five years.